Not that I promote a crazy climb nor I tolerate an insane dayhike.. No! Not that I encourage you to do an unreasonable tiring climb. This is just an optional training climb. Anyway, let’s face it! Perhaps, even the most difficult mountain requires far more than half of your strength and resistance in doing this “4 peaks” dayhike. Name it –Halcon, Guiting-Guiting, Mantalingajan, Sicapoo, Dos Cuernos or Patukan.. and maybe in the same way, you’re bound to do a major alpine climb. If you want to survive these difficult mountains, or if you’re aspiring to climb your dream mountain, preparation is not a joke. Practice makes perfect as the saying goes. I’m not saying you take it too seriously. Always remember that the very essence of climbing is to take delight in doing this found passion. So just take it lightly and enjoy the training climb. At some point in your mountaineering life, you may probably realize that to be able to sustain, you have bear the pain. Well maybe, you can only digest or accept this one if you have that burning desire to conquer yourself in greater summits or complete an epic traverse. You may completely get me if you are in your most passionate state of your desire to climb more mountains. Guess what? I am a frustrated 4peaks dayhiker! Yes I am. I tried it twice. 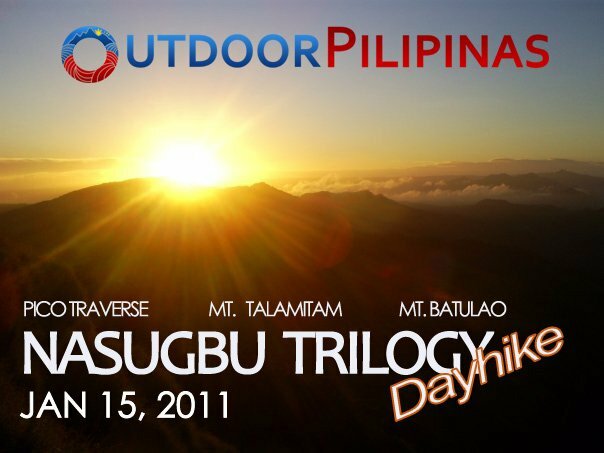 But it has always been just THREE peaks.Well, just remember my Nasugbu Trilogy dayhike, it’s three! But for those dayhike which intended to accomplish four, I’ve never succeeded yet. Let me tell you why. By the way, I did two variations. My first attempt was in July 2011.It was my first time to do a dayhike with my climbing buddy, Dennis. My only dream climb then was Mt. Sicapoo as mentioned in my previous posts. To be able to succeed in this “first attempt” to do a major climb, I decided to first try the Ambaguio-Akiki trail in Mt. Pulag and Luzon321. But before these two, I wanted to undergo a series of training climbs that time which were regular weekend hikes and of course, this 4-peak dayhike. 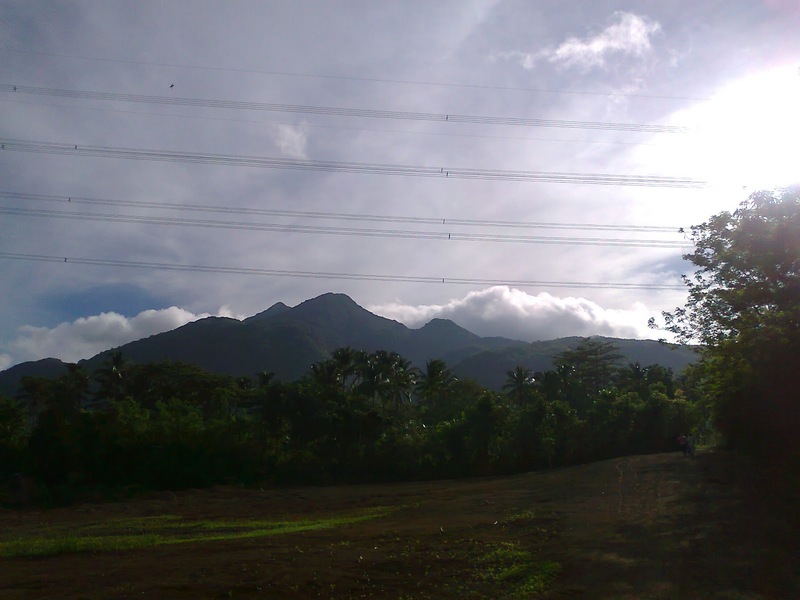 Here was the deal – Makiling traverse via Sto. Tomas – UP Los Banos (which is of course, composed of 2 peaks already) and then we shall proceed to Manabu Peak and finally Rockies. Technically,it’s a combination of your familiar Makiling traverse and 2-peak dayhike(Rockies-Manabu). We started at 7am and with so much unbridled limatik encounter (as it was rainy season), we arrived and finished at the UPLB at 1pm. After some quick wash up, we took the jeepney to Lipa and another ride thru tricycle to the jump-off point of Manabu in Brgy. Sta. Cruz. Sto Tomas,Batangas. However, nonstop rains challenged us a lot and the muddy trails (and one head lamp for two) caused us to slow down and become behind our itinerary. Apologies as I was a newbie dayhiker that time that I never thought that headlamp is always essential to a dayhike. I was taking it literally then --- I said to myself, “it’s a hiking on daytime anyway so why bother bringing a head light. LOL. How stupid!” From the peak of Manabu, we could already see Mt. Maculot covered by thick clouds. We were thinking by that time if we can still proceed to such next stop. Well we were probably convincing ourselves to something impossible. If you happened to read my post on 2-peak (Rockies-Manabu) dayhike, I told that it is advisable to climb Rockies first as jeepney or bus trip back to Lipa City is crucial after 6pm. It was only 7:30pm when we’re back to Manabu jump off point. Hopeless, my goodness! But here’s the most insane part of all --- apart from not being able to finish the fourth mountain for that day, the truth was we were considering a Mt. 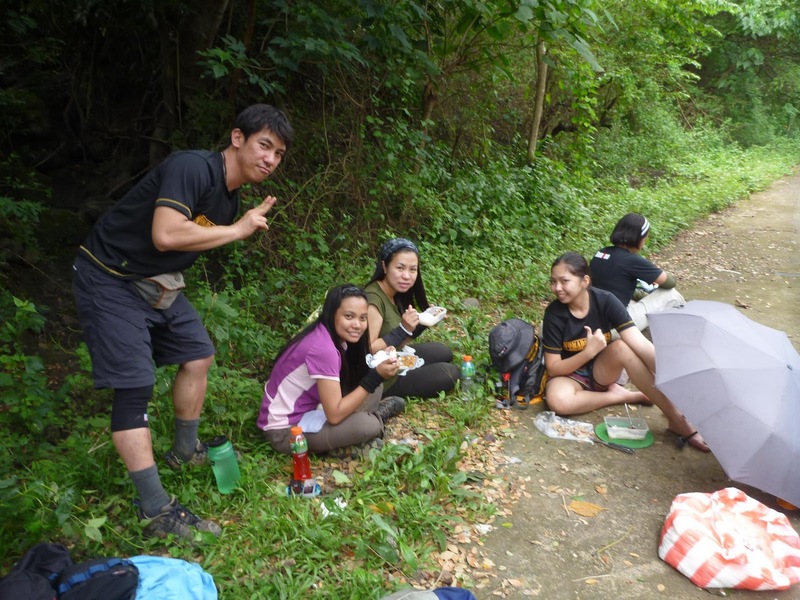 Arayat traverse dayhike scheduled on the following day!!! Whew! I even became a carrier of limatik from Batangas to Pampanga. Well, that was another experience, when a mountain leech stayed overnight inside my nose and only decided to loosen up upon being full when we arrived at the town of Dau. Here’s the thing: I may not be able to finish 4peaks on that faithful Saturday yet I was still able to still complete 4peaks on that weekend --- Peak 3 and Peak 2 of Makiling, Manabu Peak, and Arayat. What can I say? Convinced? Hehe.. Don’t get me wrong! I admit it’s not healthy anymore but it just happened that there was a committed scheduled climb with some BUSOG mountaineers (my friends in our mountaineering group) on that Sunday. And maybe, I underestimated the 4-peak dayhike that I thought it’s just an ordinary dayhike and I can manage easily Arayat traverse after doing such. During my second attempt, the deal was a Rockies- Malarayat quadro. We did it as Luzon321 climb was approaching, so I badly needed a training climb. That was sometime in October 2011. It is climbing the Rockies first and then Malarayat range in Batangas which is composed of Mt. Malipunyo(1005masl), Mt. 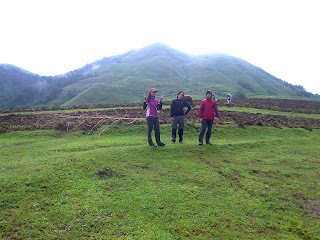 Susong Dalaga (Maiden’s Breast) and Manabu Peak(760masl). Malarayat is a range of mountains that lies in the provinces of Batangas and Laguna (a trail that ranges from Sto. Tomas, Batangas to San Pablo City, Laguna. There are, of course, other peaks but the mentioned three are the famous ones. We traveled to Cuenca very early in the morning so we first completed the trek to Rockies. We finished early. It was unusual for me descending there as early as 9:30am. Afterwards, we’re bound to proceed to Brgy. Talisay in Lipa City, the entry point in Malipunyo and Susong Dalaga. We first took the Malipunyo side. We hired a guide for Mt. Malipunyo as this mountain, per policy, required guideship of around P800. The trek was very lengthy with no view at the summit and the only thing that makes you fulfilled is the fact that you finished it anyway. Although you will be still challenged by the trail as there are also some assault parts of the trek. There were plenty of lipa (a plant that creates an itchy-painful feeling when your skin accidentally touches its leaves). We finished such backtrail climb at around 3:30pm after starting up at 11:30am. That’s why, you would imagine me getting groggy already doing the next one, Mt. Susong Dalaga trek. From the first step at the jump off point, it was doing an assault climb all the way to summit because of its almost vertical trail. What’s annoying too is the not-so-established and messy trail. I was just wearing a trekking sandals that time and I got a lot of cuts in my feet. Who could enjoy that on a night trek, with almost no view at all upon arriving at the summit. At 6pm, we started to climb it.The only reward? Well, we still reached the summit and I could finally mark this mountain with a big check. The only question was “when shall I get the eagerness to climb it again?” By the way, if you are atop Manabu Peak, you will see a great view of Susong Dalaga truly depicting a maiden’s breast. For me it was confidently lying there in a very perfect form. Finally, after transferring to Manabu jump off point, there were no one at the house where the registration and logging should be done. We decided not to proceed. Well that’s the only reason why we were not able to complete the 4 peaks for the second time. approaching the summit of Susong Dalaga Peak, it was this kind of sunset that we saw! Just like the advantage of Nasugbu Trilogy, which seems to be the prequel of this post about training climbs, the proximity to Manila as well as low budget (around 1,500 assuming 2 pax) are what make it advantageous. Imagine with such value of money and you can already explore 4 peaks. The great thing about my first attempt to climb these peaks is that, it was first time to climb them all, oh except Makiling and Rockies. I had a good reason to climb and reach their summits. Unlike buddy Dennis who happened to climb them for the "nth time". Well, that’s his role being a climbing buddy—to accompany me. Thanks so much to you! (peace, Dennis!). If you are interested or planning to do multi-peak dayhike, as I am always saying, believe that you can accomplish it. Again, pacing is sort of a crucial thing. Of course, this is given that you don’t have any advice from your doctor about your physical capabilities or any assessment about your body that may cause you to forgetting this crazy training climb. Again, believe that you accomplish it as in the course of doing a megatraverse or a very major 9/9 climb, you will face much more hardships. Again, just imagine one mountain with many peaks. I am very glad thinking that finally, this experience of mine was written up. During the heights of my urge to climb more mountains, I never got enough time to put it in the chronicles of my mountaineering life. I’ve tried.. and I am still looking forward to finally accomplishing FOUR in my next attempt. Some of you may probably heard about climbing two or more mountains in just one day. For those who may wonder, yes it is possible! This multi-peak dayhike climb has already caught the curiosity of many inclined-to-climbing individuals as they seek for more adventure and challenge. So just a few hours away from Metro Manila lie three of the famous hiking destinations in Batangas. 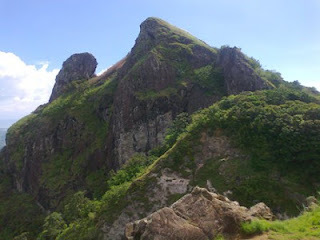 The pioneer of this climb trio called it Nasugbu Trilogy dayhike and this includes Pico de Loro, Talamitam and Batulao. 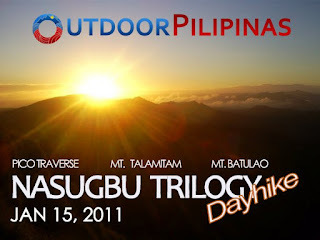 Let's call it NT dayhike, and of course they are all located in Nasugbu. Nasugbu is a town not just a home to many beautiful beaches and resorts but as you may see, it is also a sanctuary of scenic mountains. For those who are familiar with these mountains, you are right, they are all minor climbs but try to roll it into one dayhike event and it becomes a major one. 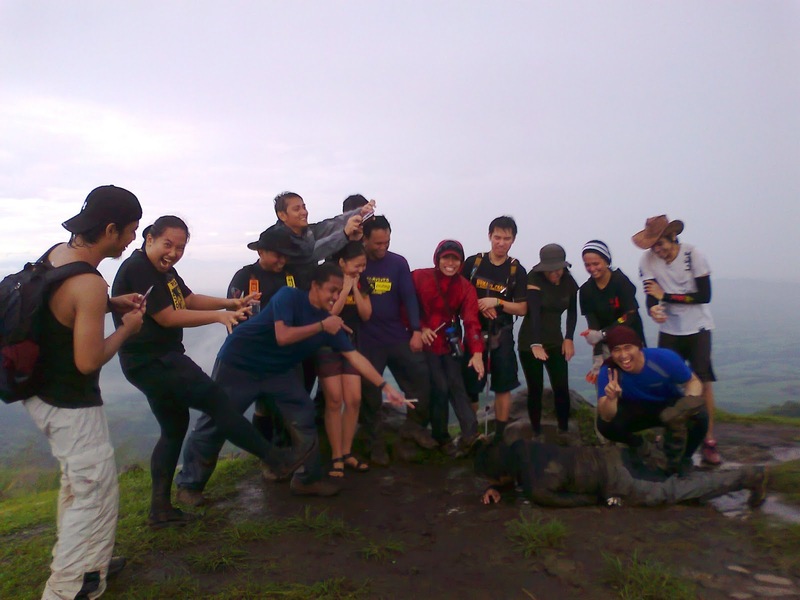 It is a dayhike with an exciting twist and extra challenge of completing all the three hikes. Otherwise, you cannot claim it as a trilogy. More than having it as an extended nature experience, some try it primarily with an intention to do a training climb as NT dayhike is a really a good practice/warm up prior to a relatively major climb. They are those who are aspiring an even more difficult trek. When I tried it in 2011 as part of my training for our Mt. Pulag via Ambaguio-Akiki trails, I was doubting myself at first and yet I was able to finish it. It's just a matter of perspective -- I've viewed it as one high mountain comprised of many peaks. For a damage to your pocket of only P500-600, you can already accomplish and explore three mountains in a single day and you can already have your desired training climb. Being near to Manila is also an advantage as it is only 2-3 hour drive to the Batangas province. The first ever NT dayhike was made possible by Sir Benj Magkalas, founder of Outdoor Pilipinas and one who has already established a good name in mountaineering community. According to him, he was looking then for a hike to train himself for their upcoming Luzon 3-2-1 climb, it is climbing the top 3 highest mountain in Luzon, thus, calling such event (as you might have noticed, NT climb is just a baby step to do an even more major trio climb, thus it's really worth trying). What they did was a Pico de Loro-Talamitam-Batulao dayhike. 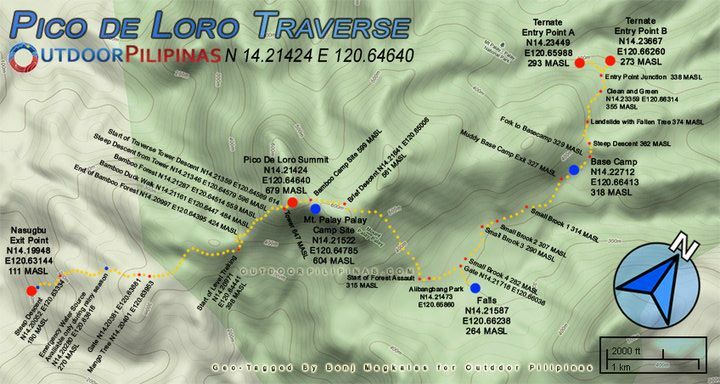 The second one, was organized by my climbing buddy and his climb buddy then, Sir Ed Bedural with the same sequence of the trek but adding one notch to the level of difficulty of the Pico de Loro climb to a seemingly insane traverse-reverse trek. Still they owe the itinerary credit to sir Benj. Apparently, there are many variations, so long it suits your satisfaction on how you will complete the trek. I joined a NT dayhike invitational climb by Dennis Hisanan in August 2011 which happened to be his 3rd time to do it, Imagine the rainy trek that we faced since it was a wet season already. But more than a wilderness experience is the creation of new friendships and an opportunity to meet more mountain fellows who share the same enthusiasm in doing this kind of outdoor. By the way, it is best to do this multi-peak dayhike with a group. Not just for budget reasons but it is best to experience and create remarkable moments with fellows. However slots are still suggested to be limited to 15 participants. There is a limit because strict compliance to the itinerary is advisable. Remember that it is a dayhike and thus you should finish the trek within 24 hours. Time is everything to this trek and pace is a high consideration. First and foremost, a chartered jeepney is required in this event as this would transport the participants from one mountain to another. 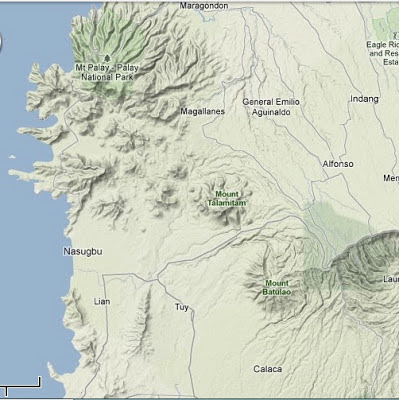 All the 3 mountains are not next to each other and they are situated in different locations in Nasugbu. Pico de Loro 's jump off point might be in Ternate, Cavite yet for the NT setting, you'll be doing a traverse having an end point on the other side which is already in Nasugbu. By the way. Pico de loro hike (at 664 MASL) is actually good for first timers, hence the mountain is relatively easy to trek. Actually, we do our invitational climbs especially organized climb for the first timers usually in this mountain). The mountain's highlight is the monolith or parrot's beak, which is just across the summit. Who could deny the picturesque and breathtaking views of Batangas' mountains and seacapes. However, initializing the traverse through a descent from the summit point marks the beginning of a steep and long trek. Poison ivy or "teka-teka" is also rampant and the forest that one would be facing is some kind of messy. In such end point of the traverse, the chartered jeepney would be waiting and would eventually transfer the group to the next mountain at around 45 mins. Standing at 630 MASL is Mt. Talamitam - the second leg of the trilogy is fairly easy trek to a seemingly bald grassland. In a matter of just one hour you should be reaching a summit of 360-degree view including the jagged silhouette of Mt. Batulao, the next and last destination. Beginning February 2013, the jump off point in Brgy Aga imposed a required guideship on the mountain for Php350 0r 400 per day. I happened to climb this mountain twice in separate events in 2011 and the only fee imposed ( which is Php25) that time was the registration fee at the barangay. Highest of the trio, is Mt. 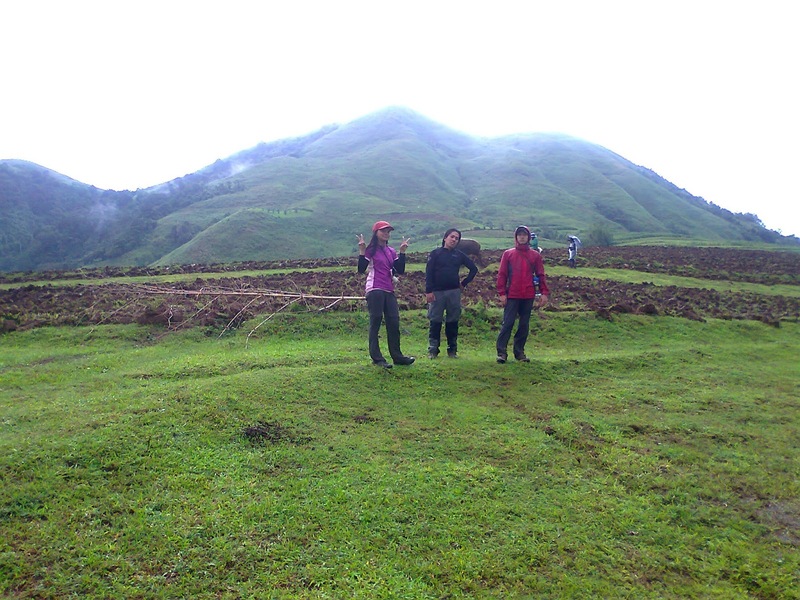 Batulao perched at 811MASL , this mountain in its bald and jagged grassland feature gives a very scenic view. It may be considered a minor climb yet its high cliff and knife edged trail still depict a risky trek. From Talamitam to Batulao jump off point is approximately 15 mins drive. Our actual NT climb in August 2011 was a group of 18 climbers and only nine of us completed the trilogy. Some were injured and already tired after the first two legs of the climb. Others just intended to join the Pico traverse or a twin dayhike which is up to Talamitam. Due to fork encounters by some of us in Pico Traverse and Talamitam, we just arrived in Batulao jump off point at around 7pm and only after some refreshments did we able to start the Batulao traverse. The traverse from old trail to new trail lasted from 9pm to 3am. Yes, that long hours of night trek was consumed. Oh well, obviously this was due to a rainy and muddy trek. Crazy act it may be but all we wanted was to finish strong and complete the trilogy. According to Dennis, the NT dayhike they made in January 2012 (originally, it was Sha Bedural's climb event but handed down to him because she was already preggy to baby Maktrav that time), given no fork encounters and a start of the first leg in Pico as early as 4am, they were able to finish by 8pm. Well this is fairly convincing, it's just like doing a regular pacing in Makiling traverse. Aiming for more difficult climb requires enough preparation, so if you want to experience more and witness more in mountaineering, you gotta prepare enough and expect for the worse. The important thing is to build stamina and get your feet used to walking in the trails at a more improved pace since many of the major climbs are strictly following the itinerary for safety purposes. If you are preparing for an undeniably high resistance-required major climb but still looking for a much friendly-to-the pocket climb, NT dayhike may be of good help to you. I'm telling you, when you've reach the point of finishing the first two legs, it's so tempting not to proceed with the last one. and that's the challenge! You might be convincing yourself that you've done so far with the first two. But let's see how long would you be able to sustain? Besides, if you won't do it, how much more awaits if you finally do a much more difficult mountain? If anyone have already done this, well, kudos to him for not giving up and completing it all. But for those who would be doing this being a first timer to all the 3 mountains, I would like to hype you up as exciting adventure and surprises truly await in this single event. It's not your ordinary weekend dayhike, not even an easy trek yet it's definitely a fulfilling one. 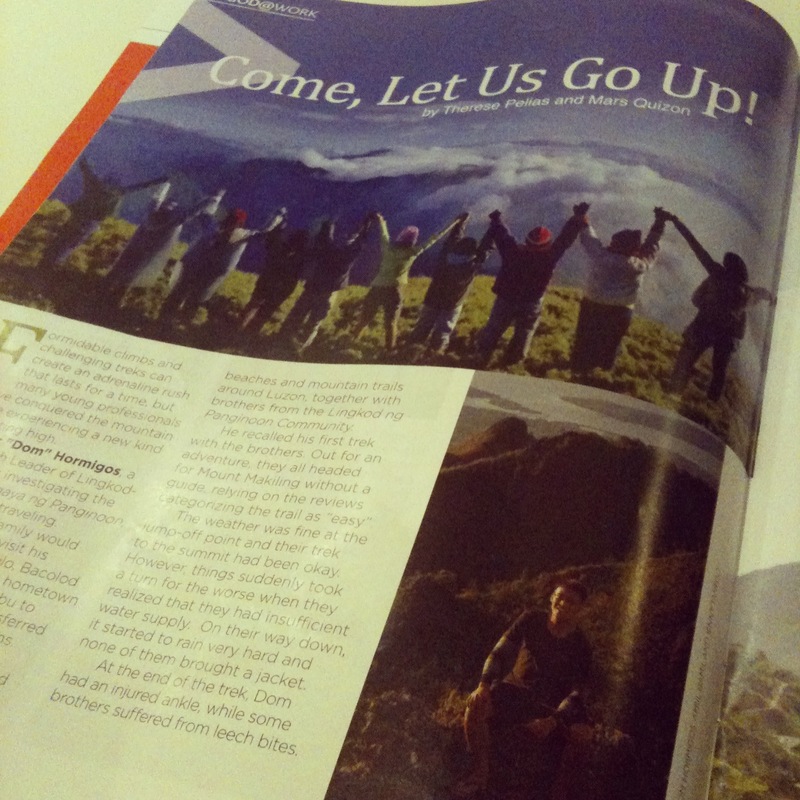 Bluish Trekker in True North Magazine! By the time, a good friend of mine, named Mars Quizon, phoned me a few months ago, I could not help but leaped for joy on the excitement of being interviewed regarding the mountaineering interests and hiking/travel activities I've been inclining to for the past two years. She is a contributing writer to the True North Magazine and a servant/sister in our community called Lingkod-Makati branch. And together with another sister named Therese Pelias, from Lingkod-Marikina, who was also a contributing writer to the said magazine, they threw a great deal of effort on making an article possible in relation to their themed issue for April, it was all about travel and journey in a deeper context. More interesting topics can also be found in the magazine and the wholeness of it succeeded in its aim to express more meaningful thoughts on being a pilgrim on a journey called life. When Mars finally gave me a copy of it, I was so happy to know that the April issue has been out already. I felt so excited. It was just encouraging and I thank God for giving me such opportunity . It was not to brag anything or the like, but it was truly a privilege and honor for me. All the glory and credits be given to the Most High. 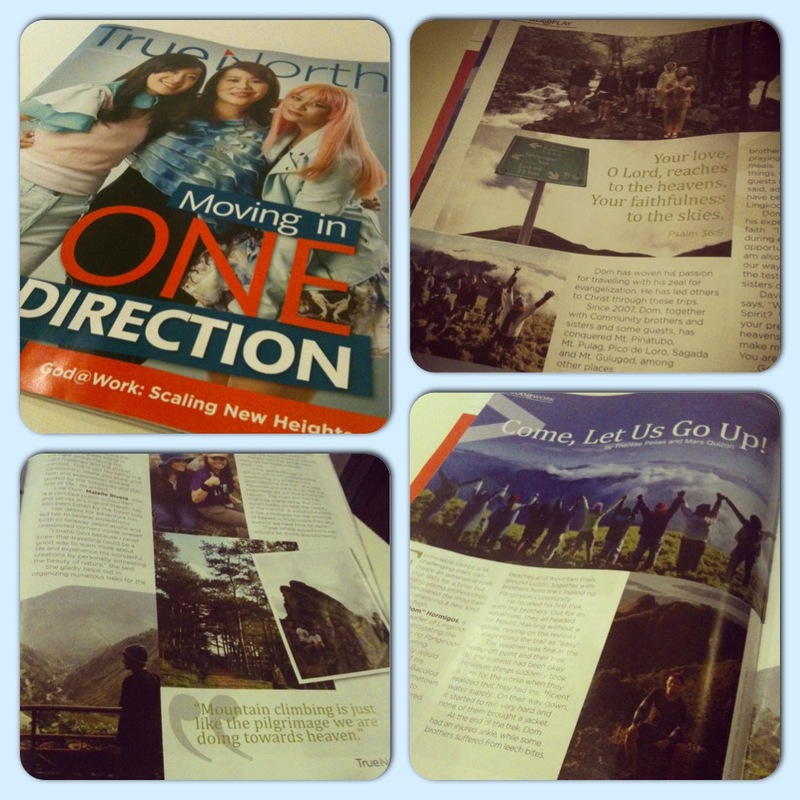 I am hoping that the article inspire not only the brothers and sisters in the community but as well as those who are searching more meaning and purpose as well as finding more colorful journey in their lives. The article entitled "Come, Let us Go up!" featured some of the travel/climb experiences, reflections and discoveries of Dom Hormigos (a brother in Lingkod-Alabang) and of mine. I am planning to post here the entire article (if the authority permits it) for the benefit of you, my viewers. For now, here's a quick look of the said portion in True North. By the way, True North is a publication of Ang Ligaya ng Panginoon and its partners - Christ's Youth in Action, Ang Lingkod ng Panginoon, and the Institute for Pastoral Development.